In vitro fertilization: What's realistic to expect? I’m a big fan of realism when it comes to infertility, because operating on false hope can get in the way of making realistic plans for parenthood. So many people view in vitro fertilization as an expensive and effective magic wand to wave to make pregnancy possible. In today’s blog I’ll try to present the facts, as well as the emotional considerations, about how soon (and for how long) to rely on IVF for fulfilling hopes of a healthy pregnancy. Last week, at a meeting of the European Society for Human Reproduction and Embryology in Stockholm, scientists discussed new research into how eggs and embryos develop and how to predict and prevent miscarriages in infertile women. However, scientists there agreed that even that knowledge is unlikely to radically boost the chances of most infertile couples trying to achieve a healthy pregnancy. So let’s first look briefly at why IVF carries such a hopeful aura. Hollywood is a good place to start, with many starlets crediting IVF for their pregnancies – and, if we look closely at the ages of many of these women becoming pregnant (sometimes with multiples), we also know that IVF may deserve the credit even if they don’t share that information with the public. So Hollywood IVF babies get lots of publicity, leading the reader to believe that it’s a procedure that can bring happy parenthood after months or years of infertility. And, speaking of multiples, publicity attached to octomoms Nadya Suleyman and Kate Gosselin has grabbed and held the public’s attention for months on end. Exhausting as their lives are, anyone touched by infertility yearns for the physical exhaustion of new parenthood as a welcome replacement for the emotional exhaustion of infertility. So IVF has moved into the mainstream of family-making in ways one couldn’t have imagined just a few decades ago. On July 25, 1978, Louise Brown became the first baby born as a result of IVF. Since that time the number has swelled to several million babies born worldwide from IVF and other assisted reproductive technologies. Yet, despite these large numbers, the success rate of IVF has climbed only modestly since 1978. About 15 years ago the IVF success rate was about 10 percent; today it is about 25 percent. Some clinics will calculate their statistics according to the age and health of the prospective mother, so data exist showing that the rate can be as high as 50 percent. However, even those impressive rates don’t usually reveal the hidden issues, such as costs, number of IVF procedures before a healthy pregnancy and life/employment disruption in general. So, if you or a loved one is considering IVF, here are some things to think about before the Hollywood bandwagon sweeps you aboard. • Many people move too quickly into IVF, when less costly procedures can be highly effective. I always encourage people with infertility issues to become affiliated with an infertility clinic (which will view the couple as the patient and will offer services 24/7 instead of being closed on holiday s and weekends when carefully-timed procedures may need to be scheduled). But this does not mean the infertility clinic will immediately offer high tech interventions when more basic procedures may be successful. Ideally a clinic’s goal is to be efficient and effective, with a variety of specialists available to offer treatment options. • As you are selecting an infertility clinic, you are likely to be drawn to those that are geographically nearby. You will want to ask about their IVF success rates. Keep in mind that many clinics “adjust” their success rates to reflect high numbers. The number that matters to you is the number of healthy births (not chemical pregnancies or unsuccessful pregnancies) for women of your age. Some clinics restrict admissions to healthy couples within a certain age range which will optimize their likelihood of success with all reproductive technologies. This is why some clinics will be able to claim a 50 percent success rate with IVF. 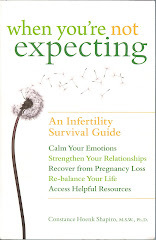 • Whatever treatment you are receiving, be sure that you and your infertility specialist have a game plan for how long to continue that particular intervention before advancing to the next one. This will maximize the likelihood of being efficient and not staying with a particular treatment past the number of times it is likely to be effective. • Not everyone has the money or the stamina for what is involved with IVF: the woman must take drugs to suppress and then to stimulate her reproductive system, and this involves taking pills and giving yourself shots each day. Daily blood tests and ultrasounds are necessary before eggs are retrieved, sperm are added and the embryos develop in a petri dish, and after three to five days the embryos are either implanted into the womb or are frozen for later use. In the last few years, doctors in the U.S. aim to implant only one or two embryos in most women, cutting the risk of multiple births to about 2 percent, the same risk as in the general population. • Although the medical treatment is physically disruptive, emotional disruption is an issue for most couples as well. Employment juggling, exhaustion, depression and dealing with feeling out of control are all common issues during infertility treatment. Be sure to check to see whether your infertility clinic offers counseling, and don’t hesitate to explore whether counseling can take the edge off of your emotional life. • You need to be paying attention to your budget and savings account throughout the period of your infertility treatments. Remember that there is only a 25 percent chance of a healthy pregnancy in most cases using IVF, yet each IVF cycle will cost more than $12,000. Check with your insurance provider to find out whether any costs of infertility diagnosis or treatment (including IVF) are covered for you. • One reason you need to be highly aware of your dwindling savings account is that individuals and couples considering adoption if a healthy birth never happens, will need to have money and emotional energy for domestic or international adoption. Early on in your infertility treatment you may not feel open to considering adoption, but as month after month of regular periods diminish your hopes for a birth child, your personal perspectives on parenthood may expand to include adoption. And you’ll want to have enough money to pursue that dream. So that leaves U.S. couples aware that good health and a woman’s age are crucial factors that increase the likelihood of having a successful pregnancy. And, as efforts to become pregnant deplete your savings account and your emotional energy you may find the voices of women in my recent book helpful as you consider other options (When You’re NOT Expecting: Chapter 10: Ending Treatment: when enough is enough; Chapter 11: Different Dreams: opening new doors to life). I’m a great believer that joining hands and hearts with others who have experienced infertility can sustain you emotionally during your creative, yet realistic, efforts to pursue parenthood.